When you live in Sanford, Florida, the great outdoors are at your front door. Located in Seminole County, near Orlando, Sanford is close to beaches, hiking trails, and is also only a few miles from Central Florida’s largest lake, Lake Jesup. It’s a wildland wrapped in an aura of adventure. Once the site where the state of Florida relocated nuisance gators, this 490 acre lake is now the perfect place to bird watch, hike, go for an airboat ride, or simply watch the sunset from the comfort of Black Hammock Restaurant. Follow along with our tips to make the most of your next trip to Lake Jesup, FL. There’s more wildlife to see at Lake Jesup than alligators— although they are the main draw. Birding is especially popular. Bring your binoculars and be on the lookout for Anhinga, American Bald Eagles, Osprey, and more. Lake Jesup is also home to the Florida Box Turtle. If you’re lucky, you may see one wandering along the lake shore or moseying into the woods for hibernation. Do you want to experience the “real Florida”? Go for an airboat ride on Lake Jesup with Black Hammock Airboat Rides. 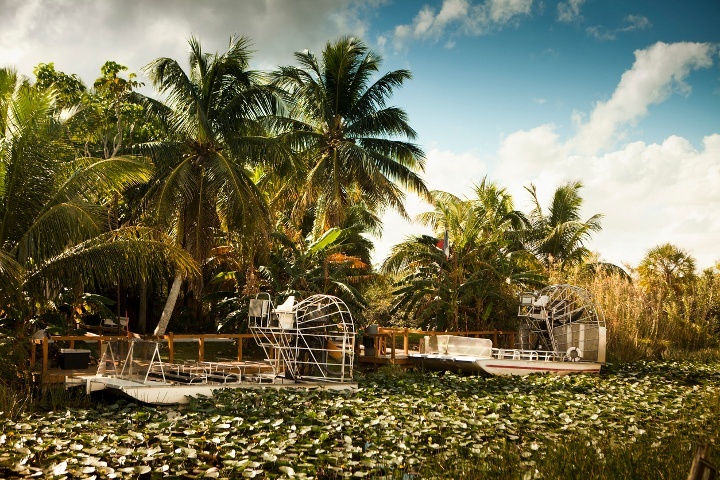 They offer US Coast Guard approved airboats, stadium seating, live animal exhibitions and feedings, and guaranteed gator sightings – the owners at Black Hammock go so far as to call the lake “Alligator Sea”. Best of all, Lake Jesup is home to some of the most gorgeous sunsets in all of Central Florida. Talk to your airboat captain about where you can find the best views! After the ride is over, you can stop in at Black Hammock Restaurant where you’ll receive a 10% discount on your meal. If you’ve ever wanted to try frog legs, escargot, or alligator, this hidden gem in Oveido is the place to do it. The “Gatorlicious” sampler even serves gator four ways: Blackened, Buffalo, Cajun, or Florida. The Lake Jesup Conservation Area East Tract provides you with quick and easy access to the best panoramas of Lake Jesup. Enjoy hiking and traversing a dense forest of cabbage palms and oak hammocks. After one mile, you will reach a sturdy watchtower overlooking the lake and Davis Point. On clear days, you can see the flight towers at Sanford International Airport. Sanford and Seminole County are a hotbed of outdoor activity. Whether exploring the wildland at Lake Jesup or lounging at nearby Cocoa Beach, StorQuest Self Storage is here to support you on your quest for a more awesome life. Our self storage units are the ideal solution when you’ve run out of space to store your gear. Give us a call today to learn more about how our Sanford self storage can help you see more and do more in Central Florida.